Tuttle and I are doing another book giveaway. I realized I had another one of Tuttle’s books, and we wanted to give you all the chance to get a free copy. Because if you want to understand Japan, you have to understand wabi sabi. When you see a piece of pottery, art, garden, or interior design and think “that’s Japanese,” it’s probably because it’s based on wabi sabi. 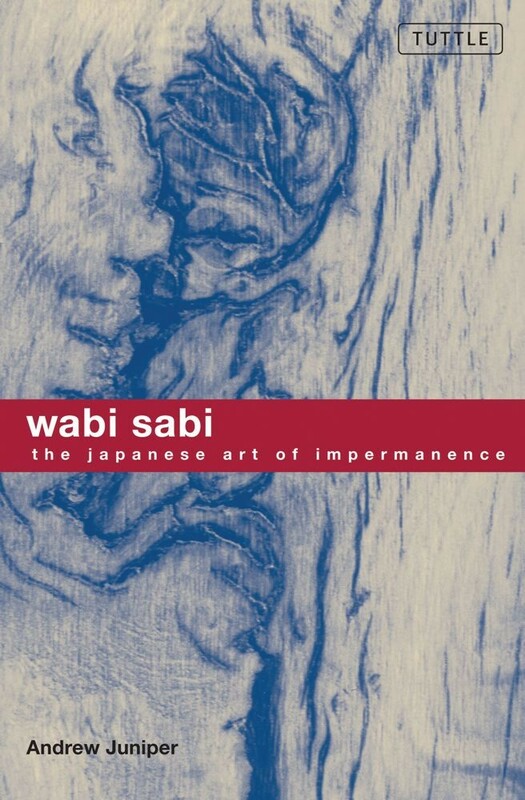 The book, Wabi Sabi: The Japanese Art of Impermanence, is one of the best books for understanding Japanese tradition’s most prevalent concept. Wabi sabi believes in a world in constant flux and finds beauty in things that reflect it. A fine piece of porcelain, perfectly symmetrical and flawless, would have nothing to attract the eye. Self-contained, it wouldn’t invite the viewer into contemplation. But an old, crumbling earthenware pot reflects the journey from birth to death. Like Feng Shui, wabi sabi has it roots in religion, so it’s not so much a system of design so much as a belief. Wabi sabi was born from Zen Buddhism, one of the key tenants of which is to overcome the fear of death. Death is the great equalizer, and in its contemplation, nothing is more important than anything else. Impermanence is a reflection of a life that inevitably ends, like cherry blossoms that must soon fall and wither. Beauty must encapsulate the flow of life. One day Rikkyu had his son prepare his garden for a tea ceremony. His son had diligently cleared every twig, leave, and needle from the lawn. He had thoroughly scrubbed every stepping stone, but none of it met Rikkyu’s expectations. When his son protested, the old master went to a maple tree and gently shook it, scattering leaves across the ground. Now, all was ready. Nature must play its hand. The pottery of wabi sabi is asymmetrical. It uses ash glazes, where the glaze is formed by ash filtering randomly through the kiln so the final product is a matter of chance. There’s a lot that I didn’t talk about and the book goes over all of it in far greater detail. And, because wabi sabi is interconnected with Japanese Zen Buddhism, it covers how they two relate. After reading the book you’ll be able to understand the vast majority of Japanese art. But for that you’l have to read. That said, I recommend this book with a single reservation. Whenever it refers to “the Japanese,” take it to mean “Japanese intelligentsia.” The author paints with too wide a brush when he talks about “the Japanese.” While wabi sabi certainly has permeated many parts of Japanese culture, the traits he gives “the Japanese” can be compared with saying that 19th century Impressionism is integral to the life of the everyday Frenchman. For the majority of Japanese, traditional Japanese culture is a lot like fishing. Everyone has fished, but not everyone is a fisherman. Only a few can tell you what every lure, bobber, and fly in a tackle box is. Even less could use them. The fact is, after reading this book, you’ll understand both wabi sabi and Zen Buddhism better than 99.99% of the Japanese population. So, if you want a copy of Wabi Sabi: The Japanese Art of Impermanence, go to the Contact Me page and tell me you want the book. Writing “I want the book” will be fine, but if you want to write anything else, it would be great to hear from you. I may have entered my comment twice so if I did please throw one of them out. I don’t want to put my name in twice. I love your blog, after I read your Mark Twain listverse article I clicked on the link and I am glad it brought me here.